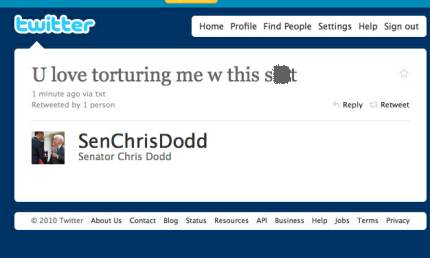 Pundit Press: Sen. Dodd Tweets: "U Love Torturing Me w this Sh*t"
Sen. Dodd Tweets: "U Love Torturing Me w this Sh*t"
It boggles my mind sometimes how people can forget that everyone can see what they write on the social networking site Twitter. More, I'm shocked at how people with thousands of followers can curse and not realize that it could be controversial. 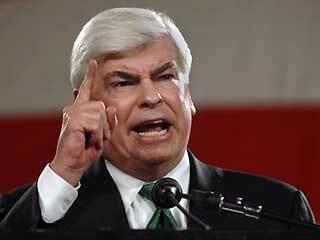 The newest culprit to forget these things: Democrat Senator Chris Dodd. However, it has been posited that Dodd did indeed write the actual tweet, as it was sent via text (notice that the message says "via txt" underneath the main writing). Yet, when the staff retracted the tweet, it was from the web, which means that different people posted the tweet and removed it. Furthermore, the actual tweet that stated that Dodd did not write the previous message was clearly marked "From Dodd Staff:"
Occasional previous tweets would stated "from staff," suggesting that Dodd did indeed write the infamous tweet.